(TORONTO – January 17, 2014) Proving that the exceptionally efficient can also be extraordinarily exhilarating, the 2014 Lexus CT 200h features fresh body sculpting for more sophisticated curb appeal, a more refined interior with new premium features, and performance enhancements that make driving the world’s first luxury hybrid sportback a more dynamic and satisfying experience. The 2014 CT 200h features additional content even as the starting MSRP drops by more than $500. New for 2014, the Lexus CT 200h now sports the signature Lexus Spindle Grille that reinforces the vehicle’s low front profile and wide, sporty stance. Additional updates include new front and rear bumper designs, added aero-stabilizing fins, new 10-spoke 16” aluminum alloy wheel design, a redesigned rear spoiler, a shark-fin antenna and LED licence plate lamps. The 2014 CT 200h is also offered in a new exterior colour – Redline – and all paintwork is now protected by a scratch-resistant, self-restoring top coat. Inside, the driver-focused cabin seats five passengers and is enhanced to be more pleasing to the eye and more welcoming to the touch. The driver now benefits from a new steering wheel, a new shift lever design, extendable sun visors, a tire pressure monitoring system and a switch to turn off the Traction Control system for more direct control on closed tracks. Additional enhanced features for 2014 include the available Lexus Display Audio system, including the world’s first use of bamboo-fiber loudspeakers. Other features include: steering wheel-mounted audio system controls; Bluetooth connectivity with steering wheel-mounted controls; Integrated Sirius XM Satellite Radio; USB audio input jack; and more. Other standard features include: dual-zone automatic climate control; power-adjustable and heated front seats; power door locks with keyless entry and key lock-out protection; power windows with auto up/down function and jam protection on all windows; a three-spoke leather-wrapped steering wheel on a tilting/telescoping column; plenty of thoughtful in-cabin storage including front door integrated water bottle holders; cruise control; the Smart Key System with Push Button Start; instrumentation including a tachometer and ECO indicator; dual power adjustable heated exterior mirrors with integrated signal lamps and puddle lamps; fog lamps; LED daytime running lamps; and more. Performance is also enhanced for 2014, with a more rigid body structure, revised suspension systems, and enhanced aerodynamics. The result is a more agile, engaging driving experience. Every CT 200h is powered by a Lexus Hybrid Drive designed to deliver maximum performance and efficiency. This system is built around a 1.8L Atkinson Cycle four-cylinder engine, a high-torque electric motor, high-power storage battery and sophisticated power management system. The CT 200h may be operated in four drive modes: Normal, Sport, ECO and EV. The 2014 CT 200h also features a quieter cabin environment, thanks to 94 specific measures taken to further reduce noise, vibration and harshness. Safety is always standard on a Lexus, and every 2014 CT 200h features Vehicle Stability Control, Traction Control, Antilock Braking System with Electronic Brake Force Distribution and Brake Assist, eight airbags, an onboard first-aid kit, anti-theft system, and more. This model features newly designed 17” aluminum alloy wheels, aluminum scuff plates, a power moon roof, newly-available LED headlamps and fog lamps, and an additional storage compartment with 12-volt electrical connection. This model features newly designed 17” aluminum alloy wheels, aluminum scuff plates, a power moon roof, LED headlamps and fog lamps, a 10-speaker Lexus Display Audio System with 7” display and audio controller; leather seat surfaces, a driver’s seat memory system linked to the exterior mirrors, reverse auto-tilting mirrors, integrated garage door opener, a back-up camera, rain sensing wipers and more. This popular model features a new lower starting MSRP – even as it benefits from newly designed 17” aluminum alloy wheels and other enhancements. Outstanding features on this configuration include LED headlamps and fog lamps, a 10-speaker audio system with in-dash DVD, a voice-activated SD based navigation system with the second-generation Lexus Remote Touch haptic controller, leather seat surfaces, a driver’s seat memory system linked to the exterior mirrors, reverse auto-tilting mirrors, aluminum scuff plates, a power moon roof, integrated garage door opener, a back-up camera, rain sensing wipers and more. Enhancements to the 2014 CT 200h also focused on creating an F SPORT package with a more powerful road presence. 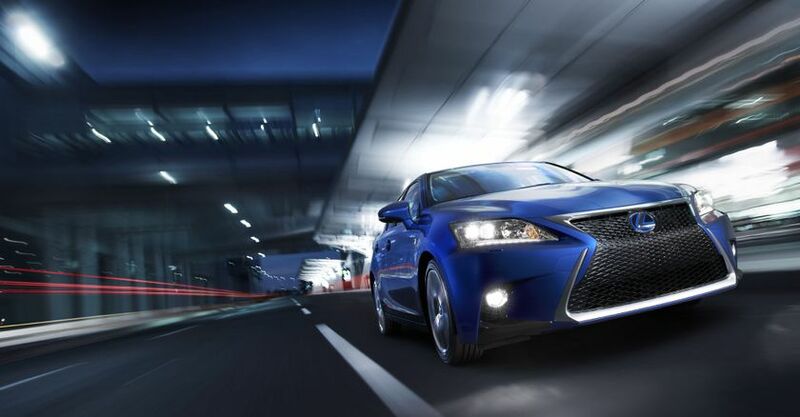 From style to performance, the 2014 Lexus CT 200h F SPORT is more distinctive than ever. The Spindle Grille is given a unique F SPORT interpretation with an aggressive mesh pattern that’s carried through to the fog lamp housings. An exclusive rear spoiler features cut-outs to provide additional downforce for even greater grip and stability. The new 17” split 5-spoke alloy wheels feature a unique F SPORT surface treatment. Inside, the F SPORT package features exclusive upholstery, ornamentation and trim, including an F SPORT steering wheel, F SPORT leather seats, F SPORT scuff plates and F SPORT aluminum sport pedals with rubber inserts. The 2014 CT 200h F SPORT benefits from all of the newly introduced performance enhancements, plus front and rear performance dampeners to further enhance its sporty driving dynamics. F SPORT package is further enhanced with a power moon roof, LED headlamps and fog lamps, a 10-speaker Lexus Display Audio System with 7” display and audio controller, a driver’s seat memory system linked to the exterior mirrors, reverse auto-tilting mirrors, integrated garage door opener, a back-up camera, rain sensing wipers and more. 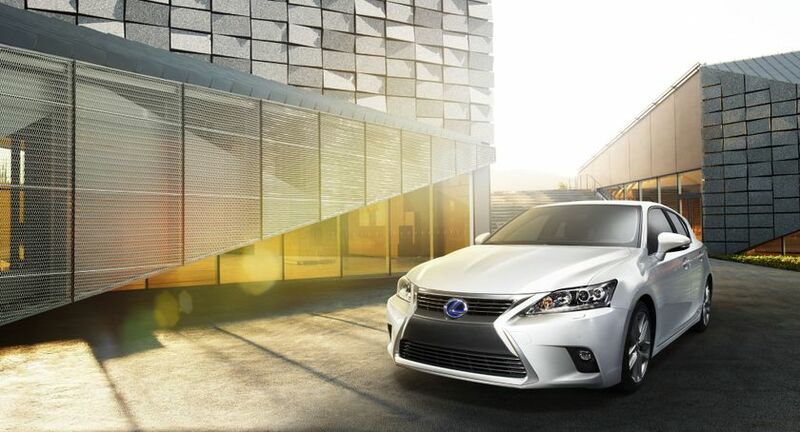 The 2014 Lexus CT200h is now on sale at Lexus Dealers across Canada.